Bo Jordan was about 10 years old when his father felt his son was ready for national competition. And one of the first tournaments the native of St. Paris, Ohio, competed in that year was the 2003 Cliff Keen Kickoff Classic in Tulsa, Okla., which the young Jordan won. The oldest son of Jeff and Amy Jordan also remembers who presented the trophy: Dan Hodge, who was more than the legendary wrestler from Oklahoma University in the 1950s to a nine-year old. 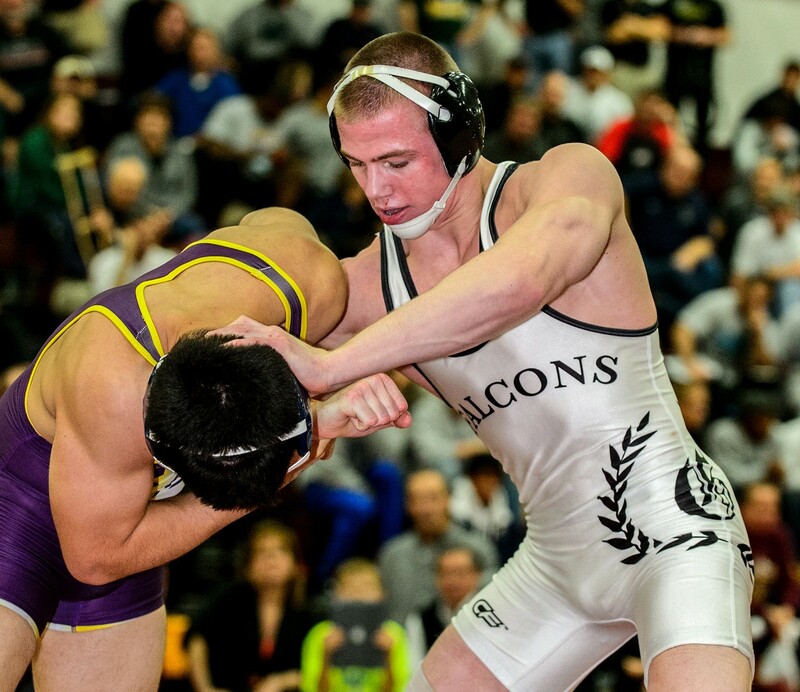 Among Bo Jordan’s 49 victories in an unbeaten senior season this past winter was a second straight Ironman championship against California’s Isaiah Martinez in December. Jordan went on to win four Ohio state championships and two OW honors in his career at St. Paris Graham High School. Jordan will wrestle at Ohio State next winter. 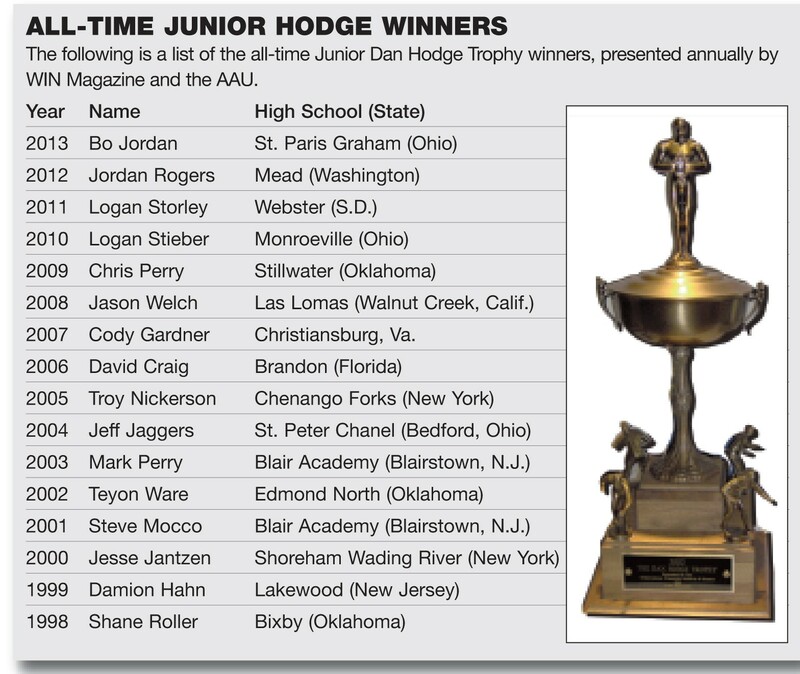 And now ten years later, Bo Jordan is able to enjoy the legacy of Dan Hodge again … after the four-time Ohio state champion from St. Paris Graham High School was named the recipient of the 2013 Junior Dan Hodge Trophy, which is presented annually by WIN and the Amateur Athletic Union to the nation’s most dominant high school wrestler. All one has to do is look back at the past four years of Bo’s career, which saw him win 182 of 183 career matches and also presented him two Outstanding Wrestler awards in the state of Ohio’s Division 2 state tournament. In the last three tourneys, 9 of his 12 wins came by pin. He tallied 122 pins in his career. 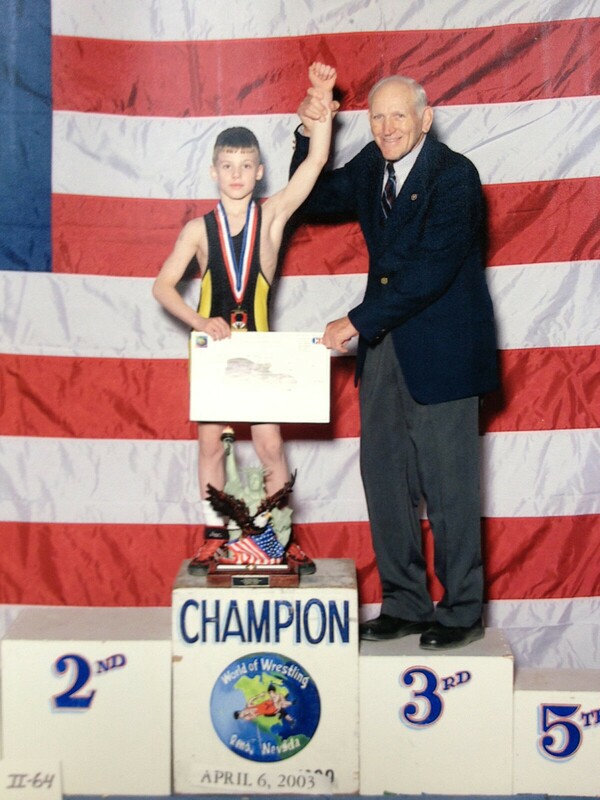 Bo Jordan (left) met the legendary Dan Hodge in 2003 when he won the Cliff Keen Kickoff Classic in Tulsa when he was nine years old. This past season, Bo compiled a 49-0 record at 160 pounds, which included 34 pins, ten technical falls, three forfeits and one major decision. The only wrestler who did not get beat by more than eight points in a match against Jordan was California’s Isaiah Martinez. An OW himself at the California state tourney and two-time champ, Martinez lost to Jordan for a second straight year in the finals of the Walsh-Jesuit Ironman in December. The two could continue to meet frequently in college. Jordan has signed at Ohio State; Martinez is also headed for the Big Ten Conference. He joins former Cal Poly coach Mark Perry Jr. and Jim Heffernan at Illinois. And all of Bo’s mat success has come while wrestling for his father, Jeff, the long-time successful coach at St. Paris Graham High School. “When he became a teenager and I felt if we continued to work hard and God blessed him with a little bit of talent, I felt he could go a long ways,” said his father, who also introduced his son to former nationally-ranked high school wrestlers at the Jeff Jordan State Champ camp in St. Paris. There would be other wrestlers who attended the camp and succeeded past college, including Penn State’s 2012 Hodge Trophy winner David Taylor, who moved from Wyoming to St. Paris Graham to wrestle in high school. One reason Bo never rebelled against his father’s mat teachings and philosophy was that they separated their relationship when it came to wrestling. “He would tell me, ‘In the wrestling room, you’re coach. On the way home, you’re dad,” recalled Jeff, who also has two other sons wrestling: Micah, a 132-pound junior, who captured his third Ohio state championship for Graham High; and Rocky, a seventh grader in the St. Paris school system. “Whether I think what he tells me is right or wrong, if it’s in the practice room, that’s what I’m going to do because I believe it will make me better,” said Bo. Jeff said one of his son’s bigger strengths, as a wrestler, is his strength. “I was one of those crazy dads who had him do a lot of resistance training from push-ups to pull-ups,” the elder Jordan said. “I used to keep a journal on how many push-ups, pull-ups and sit-ups he’d do ever since the age of 5. Jeff said that strength has helped his son dominate wrestlers from the neutral position. “On his feet, he really, really hand fights and really gets guys tired,” said Jeff. With the reputation Bo has gained through his work ethic, it sometimes leads to others speculating if it’s the work ethic or his athletic ability and strength which makes him the most dangerous. With Ohio State and their Regional Training Center an hour east of St. Paris, Jeff is happy Bo can now go there to train. Jeff, a two-time All-American at Wisconsin in 1987 and ’88 at 150 pounds, still offers his son tips on what he could face that first year. Bo Jordan’s only high school loss was to former Walsh Jesuit star Nate Skonieczny. It came during Bo’s freshman year in his 21st high school career match in the in the finals of the 2010 Top Gun tournament in Alliance, Ohio. Bo lost in a 2-1 overtime tiebreaker. “After that, I just trained hard,” said Bo, who avenged that loss in the state semifinals that winter. “When you lose, it kills you. “I didn’t make the commitment because my coaches were telling me to do it. I did it because I wanted to do it deep down. I wanted to go to practice. I wanted to do cardio after practice. I wanted to go the extra mile. Bo also excels in the classroom, carrying a 3.4 GPA. The AAU’s Bob Johnson said Jordan is the type of student-athlete you look for in a Junior Hodge winner. “Bo’s a great student and wrestler. I have no doubt he’ll excel at Ohio State too. He’s exactly the type of kid we look for each year for the Junior Hodge,” Johnson said.